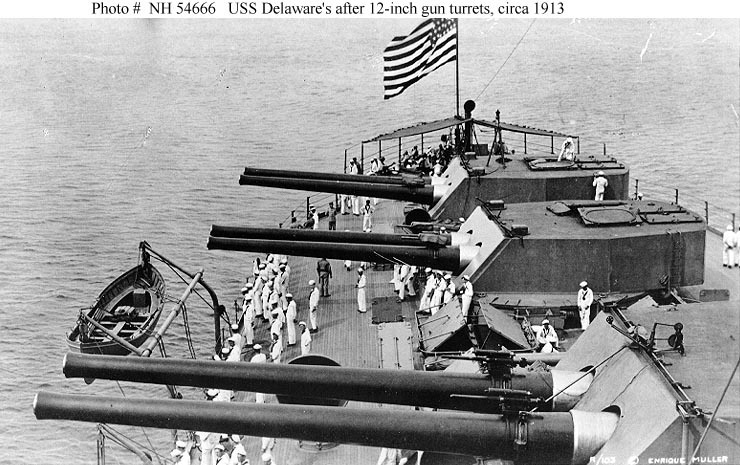 The Delaware class were the U.S. Navy's first real "Dreadnoughts", carrying an "all-big-gun" main battery at a speed of over twenty knots, thus enabling them to deliver a greater volume of heavy shell fire than previous battleships, while keeping outside the range of those ships' numerous medium-caliber guns. 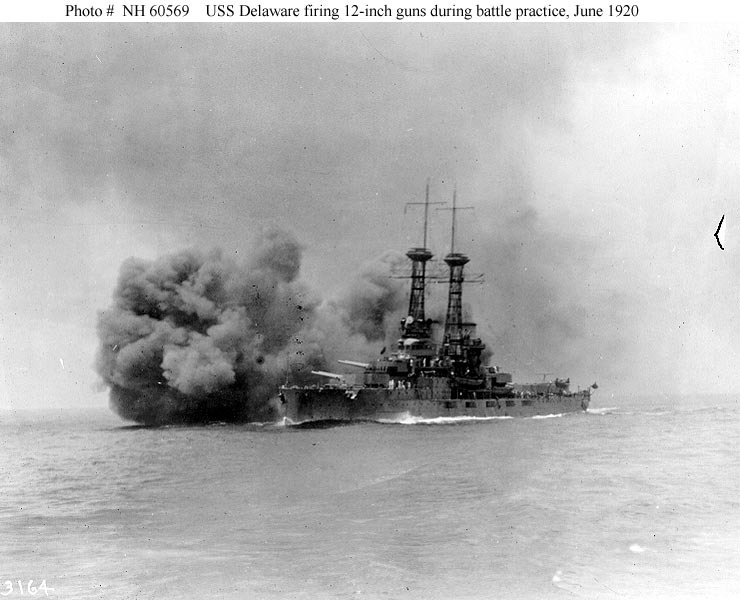 Their Congressional authorization did not specify a maximum size, so the Navy designed Delaware and North Dakota to be a quarter larger than their immediate predecessors, with two more twelve-inch guns, a secondary battery of five-inch rather than three-inch guns, and two-and-a-half knots greater speed. To test the relative virtues of competing machinery types, Delaware was fitted with the older triple-expansion reciprocating engines, while her sister got direct drive Curtiss turbines. The latter were replaced in 1915 with more efficient geared turbines of 31,300 horsepower. Both battleships were widely-travelled, making trips to Europe both before and after the First World War. 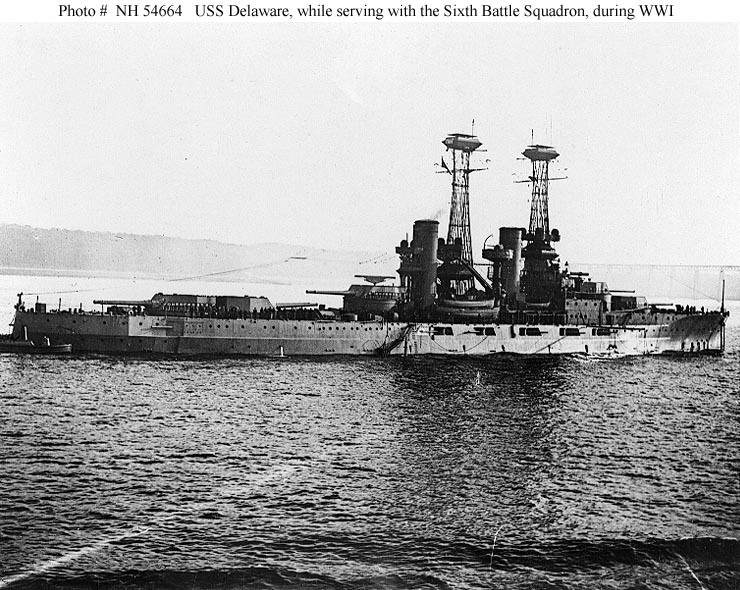 Delaware served with the Grand Fleet in the North Sea during 1918, while North Dakota remained at home training sailors for participation in the conflict. Despite being only a decade old, their design was obsolescent by the late 'teens and early 'twenties, and they spent their final years largely employed on training duties. 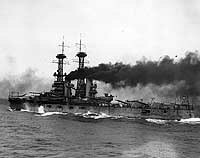 They were demilitarized in 1923, when completion of new battleships rendered them excess to Washington naval limitations treaty limits. Delaware was scrapped in 1924. 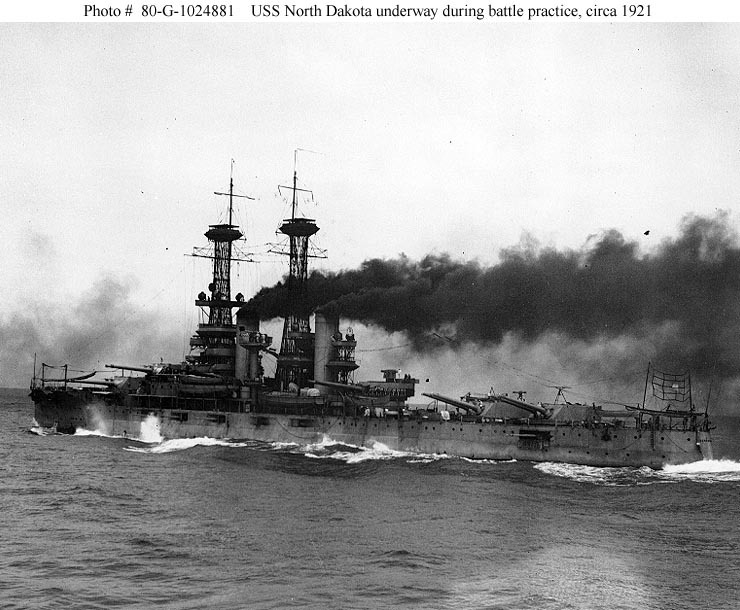 North Dakota, reduced to an auxiliary role, lasted until 1931. Delaware (BB-28), built by the Newport News Ship Building and Drydock Company, Newport News, Virginia. Keel laid in November 1907; launched in February 1909; commissioned in April 1910. 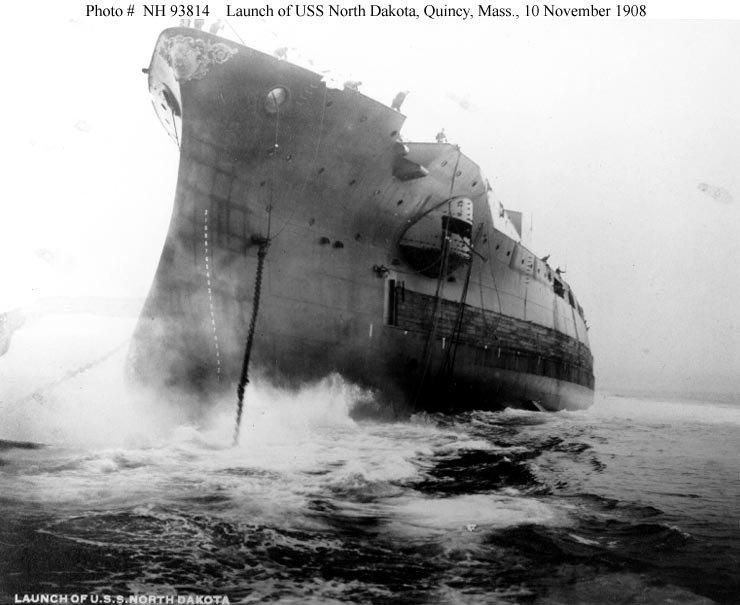 North Dakota (BB-29), built by the Fore River Shipbuilding Company, Quincy, Massachusetts. Keel laid in December 1907; launched in November 1908; commissioned in April 1910. Powerplant: 25,000 horsepower, two propellers, 21 knot maximum speed. Triple-expansion reciprocating engines in Delaware. Direct-drive steam turbines in North Dakota. Armament (Secondary Battery): Fourteen 5"/50 guns in single casemate mountings. 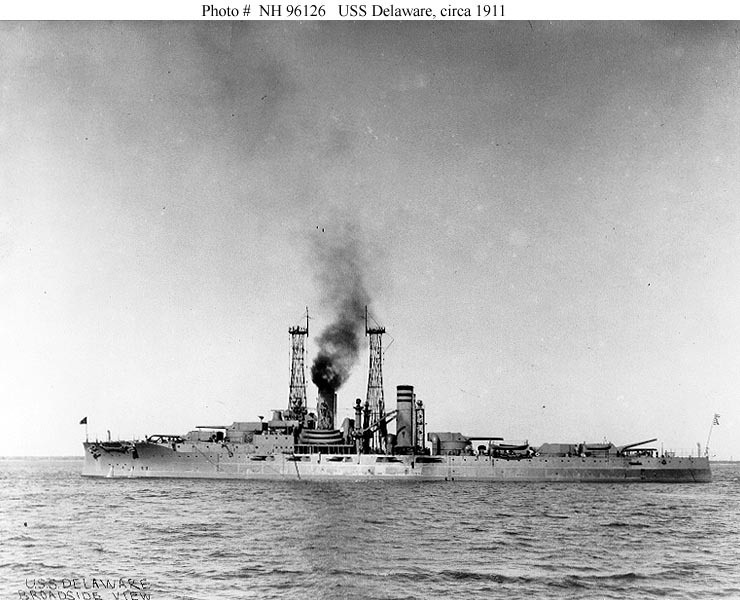 This page features a modest selection of photographs of Delaware class battleships, plus images related to these ships' basic design features, and provides links to more extensive pictorial coverage of the individual ships. 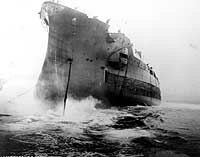 Launching, at the Fore River Shipbuilding Company shipyard, Quincy, Massachusetts, 10 November 1908. Note that the ship wears a bow decoration, a feature removed before her completion. Courtesy of the Submarine Force Library & Museum, Groton, Connecticut, 1982. Note that the 12"/45 guns of her after turret are at different elevations. In British waters, while serving with the Sixth Battle Squadron in the North Sea area, 1918. Location is probably the Firth of Forth, Scotland. Underway during battle practice, circa 1921. 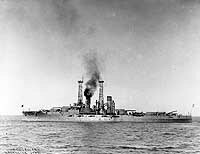 Note sighting target mounted above her stern; all guns trained out on the port beam; heavy coal smoke. 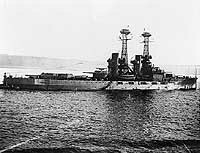 Ship's after three 12"/45 twin gun turrets, circa 1913. Note the sub-caliber spotting rifles mounted on the barrel of each heavy gun, gunsight practice gear fitted across the top front of each turret, and whaleboat swung out on davits. 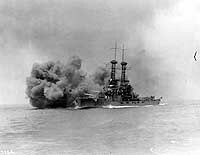 Firing her 12"/45 main battery guns during battle practice, 26 June 1920.